Heads up: this recipe is sponsored by Lentils.org in collaboration with their #SpringCleanse campaign. Scroll to the end to enter the sweepstakes! 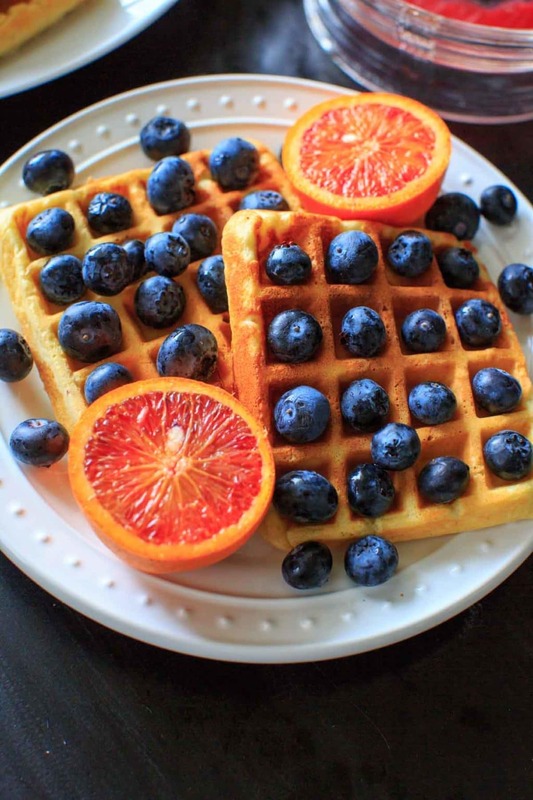 Belgian Waffles made healthy with split red lentils, blood orange juice and blueberries. Breakfast doesn’t get any better than this! 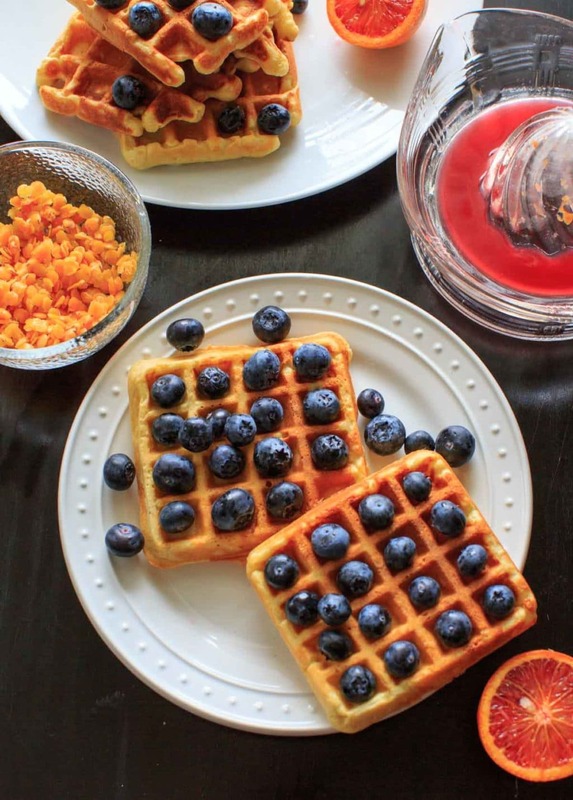 This waffle recipe is brought to you by… lentils. Over a year ago, I went to a conference where one of the breakfasts was sponsored by Lentils.org. When I first saw that on the agenda, I thought we’d be eating lentil soup for breakfast. There were muffins and scones and energy bites and lentil granola parfaits. It was like lentil paradise. Learning about the versatility of lentils was amazing. Ever since then, it has been on my list to be like the cool kids and use lentils in an unexpected way. So when I was asked to participate in their #SpringCleanse campaign, I knew this was my chance. This hashtag is right on trend because it is PRIME TIME for spring cleaning. The other day I did a deep-clean of my kitchen AND my pantry. I felt like superwoman after I was done. Spring cleansing goes hand in hand with spring cleaning. All those baked goods and comfort foods from the holidays and cold weather have weighed us down (literally and figuratively), and the weather warming up has our bodies craving healthier foods that will still keep us fueled throughout the day. Healthy food doesn’t have to be boring, guys. I’ve tried to make that a theme on this site but it’s especially true with these waffles. Last week (around the time I deep-cleaned the kitchen) I suddenly had a craving for pancakes. Which was weird, because I don’t really like pancakes. I much prefer waffles. But the pancake craving persisted. Since I was also brainstorming lentil recipe ideas, I finally realized: I should make lentil pancakes! Wait, I thought I was talking about waffles? I’m getting there. I proceeded to make several different versions of pancakes incorporating lentils. And since I don’t LIKE pancakes, I couldn’t quite get the recipe to feel blog-worthy. It wasn’t the lentils fault, it was the pancakes fault. Not only did none of the pancakes turn out but my pancake craving was long gone after the first batch. So. WAFFLES. Because that’s what I originally said I like better anyway. Lentils are a pulse crop, like beans, peas and chickpeas. 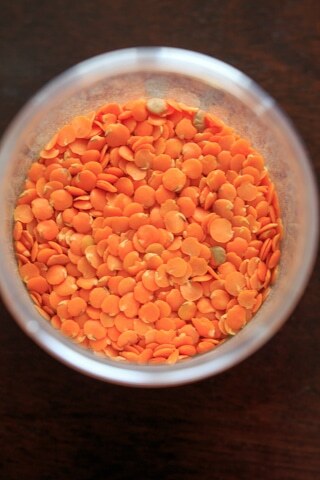 Most commonly you will find whole green lentils or split red lentils at your local grocery store. This waffle recipe uses split red lentils, which means their seed coat has been removed and they cook a lot faster than whole lentils. They are high in protein, fiber and other nutrients such as iron. Because of this, they make a great addition to healthy meals. The opportunities are endless here, let your creativity go wild. You can cook a bunch at once if you like and refrigerate or freeze the leftovers for other meals later. This recipe uses 1/2 cup dried lentils (which will at least double when cooked to make 1 cup). 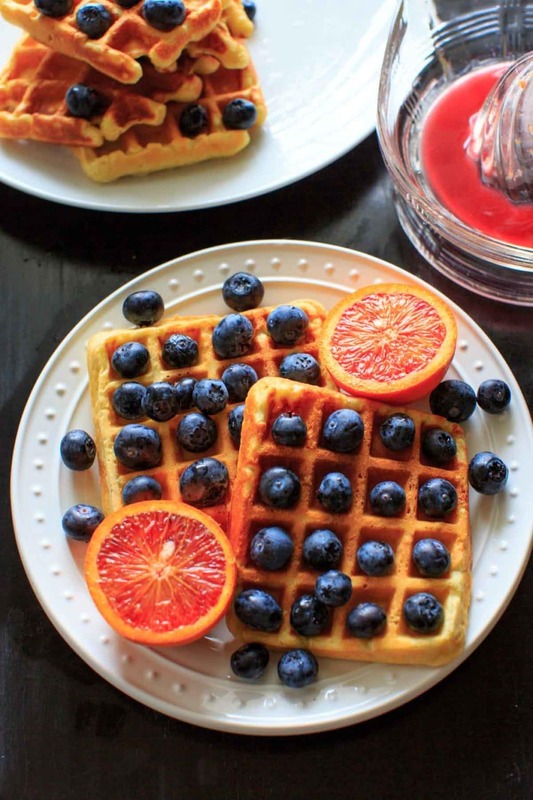 But why did you put blood orange juice in the Belgian waffles? And what are blood oranges anyway? 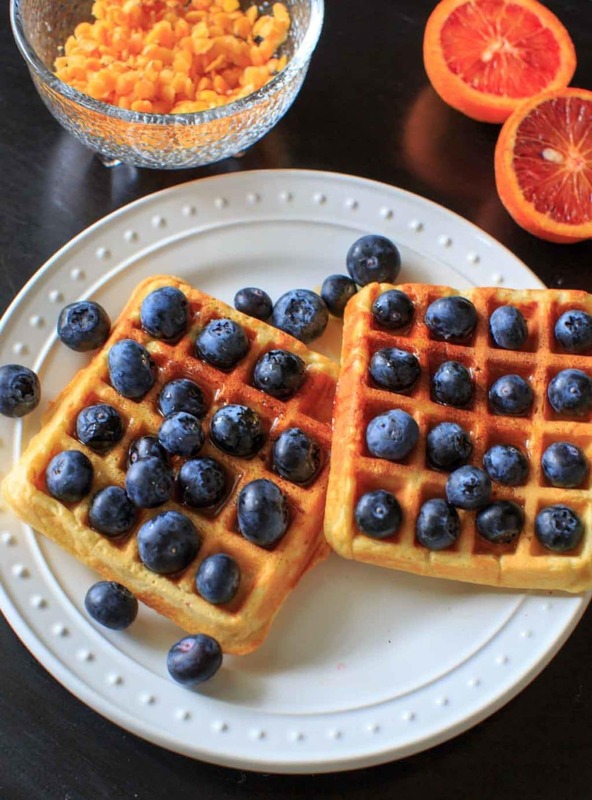 I’ve been known to add regular orange juice to other recipes to sweeten it up, so I wanted to add an extra twist to these waffles by replacing some of the milk with blood orange juice. Naturally this idea came to me solely because that I had a big bag of blood oranges. Blood oranges have more antioxidants than regular oranges, and that’s where they get their red color from. They are less acidic than regular oranges and have more of a berry flavor, which is why I thought they’d go well with the blueberry theme. They are fairly small (at least the ones I have) so I only used 1/2 cup juice. That took 6 blood oranges. If you want to get fancy you can also add some of the zest to the recipe. Guys: I DON’T LIE TO YOU. So when I say these lentil Belgian waffles are amazing and you can’t taste the lentils and it’s not weird AT ALL you should BELIEVE me. You know I like to substitute weird ingredients sometimes (case in point: chickpea cookie dough and avocado mousse). But I always tell you. I don’t try to hide it from you or tell you it tastes different than it does. The lentils blend up easily after cooking for 5 minutes. I add them in the blender with the OJ to help them blend well. So you won’t see or taste them. You’ll just be adding all the nutrition to your breakfast. So seriously. Add the lentils to your Belgian waffles. You won’t regret it. Confession: Sometimes I have to reign myself in. I ALMOST made these gluten-free by trying coconut flour instead of all-purpose (inspired by my recent coconut flour baking). 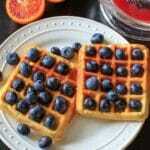 Blueberry and blood orange coconut flour lentil Belgian waffles was just too much of a mouthful. How are you Spring Cleansing? Will you try these waffles? Let me know in the comments! 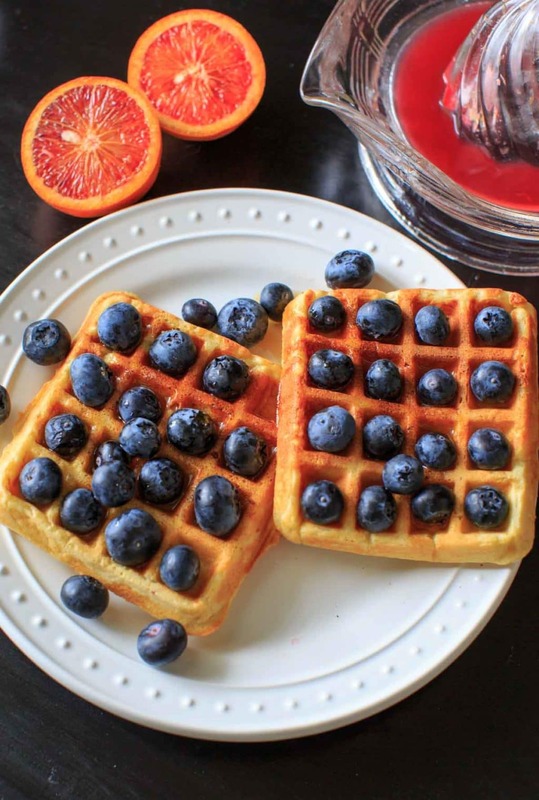 Belgian Waffles made healthy with split red lentils, blood orange juice and blueberries. Breakfast doesn't get any better than this! Rinse lentils and combine with water in stove pot. Turn on high heat to let boil, then reduce head to low and let simmer for 5-7 minutes until soft. Remove from heat and strain out extra water. Add the flour, baking powder and salt to a bowl and set aside. Place the egg yolks in a large bowl. Add milk, coconut oil, sugar and vanilla. 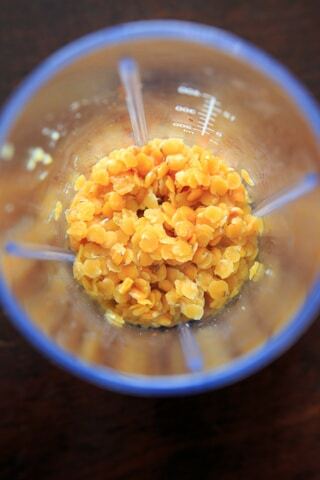 In a blender, add the cooked lentils and the blood orange juice and pulse until blended. Add to egg yolk mixture. Add in flour mixture and stir to combine. In a separate bowl, whip the egg whites until stiff peaks form. Fold gently into the rest of the batter. Pour batter into waffle maker. 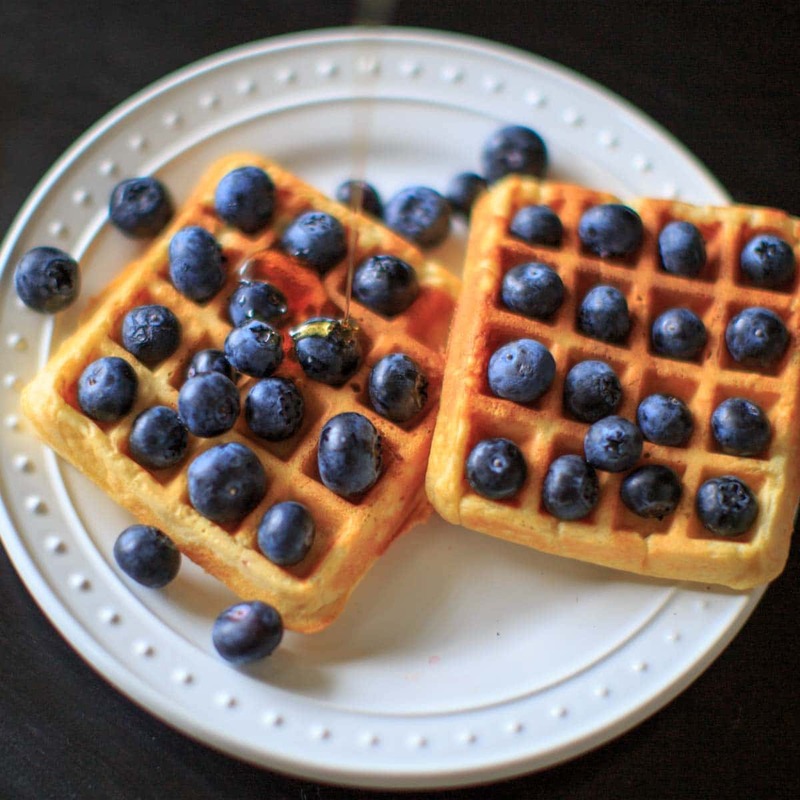 Top waffles with fresh blueberries and maple syrup. *Nutritions facts listed are for waffles only, not toppings. What a smart idea! 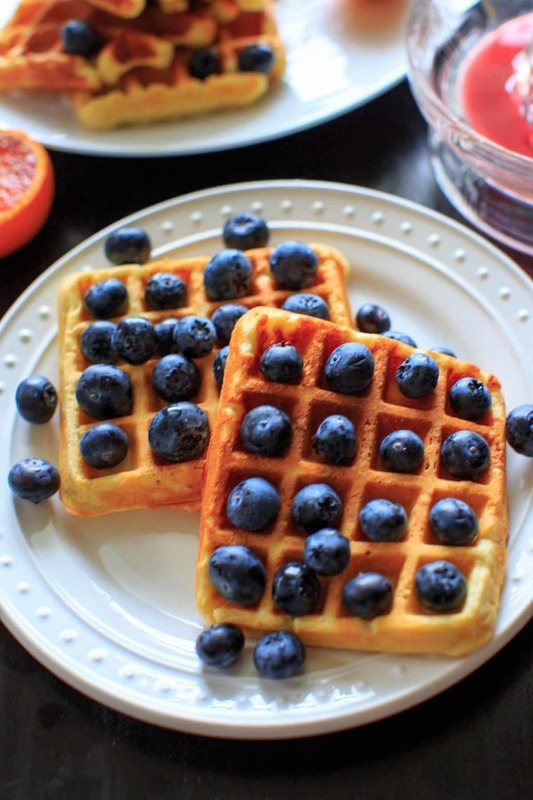 Such a great way to make waffles a little healthier! As a vegetarian, I loooove finding new ways to use lentils. Thanks! Thanks Liz, it was fun to play around with adding lentils to new foods! Who would have thought to include lentils in a waffle recipe. After reading your post, I think that this is a healthy and tasty idea and will try. It NEVER occurred to me to use lentils in baked goods, but I am so happy to learn that I can make naughty waffles so much healthier! Replacing some of the milk with orange juice is pure genius. Thanks Michelle! The OJ is a old favorite trick of mine.. but the hidden lentils thing is a new favorite! These look great! We’re big waffles lovers in my home. My youngest LOVES fresh blueberries on top too. I bet the waffle batter tastes amazing with that fresh blood orange juice in it. So pretty! What the what is exactly what I thought when I read the title of this post but man, do these waffles look good. Being on a gluten, sugar and dairy free diet for my Rheumatoid Arthritis, I sure do miss eating waffles. Thanks for sharing, pinning o my GF board.